At Home With Benji, 5 Months (Videos!) — The Miscellany of Shannon B. Little dude is getting pretty good at sitting up on his own. Before we head off for our big road trip to the States tomorrow, I thought a “Life with Benji” post was in order! Subjects include - but are not limited to, certainly - (not-)sleeping, eating, and sitting up! I’m trying to think of the most descriptive, accurate way to explain how and what parenting is at this moment... When chatting with friends, mostly about the struggle with baby sleep patterns, I’ve described it as a devilish game of Whack-A-Mole. I think that would accurately describe the whole thing, actually, not just the sleeping. 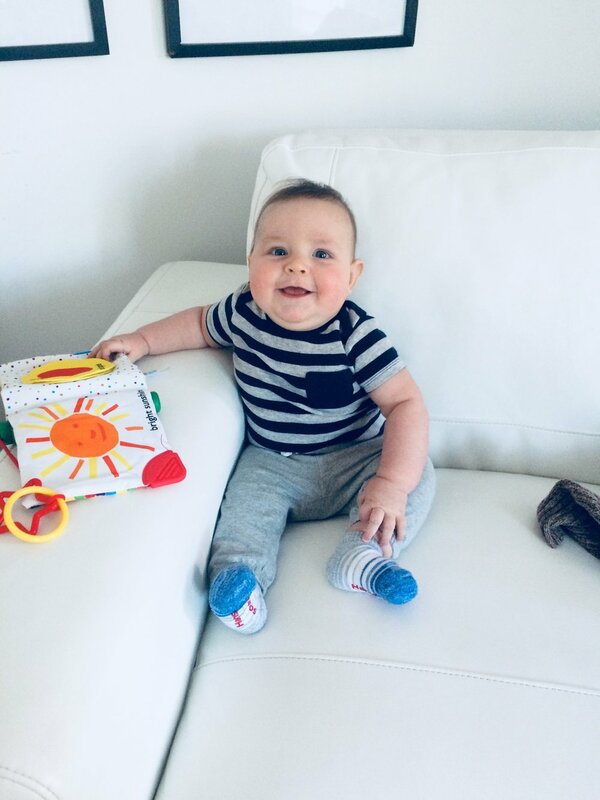 Parenting a 5-month-old is not your common, everyday-type of problem-solving, wherein the solution is found by isolating the cause… because it’s never evident what the CAUSE really is! Everything’s all tangled up. Once you’ve gotten one thing worked out, another thing pops up, and it might be related to other thing, or it might not. The catch is that YOU WILL NEVER KNOW. Take sleep. If he’s not sleeping well, is it because he’s not eating well? And if he’s not eating well, does it have something to do with my milk supply? Is he having a growth spurt and needs more milk than I can produce in the moment, and it will self-regulate in a few days? Or maybe he’s teething? He’s got all those symptoms, but no teeth yet…or is it something else? An accurate depiction of the last few weeks. 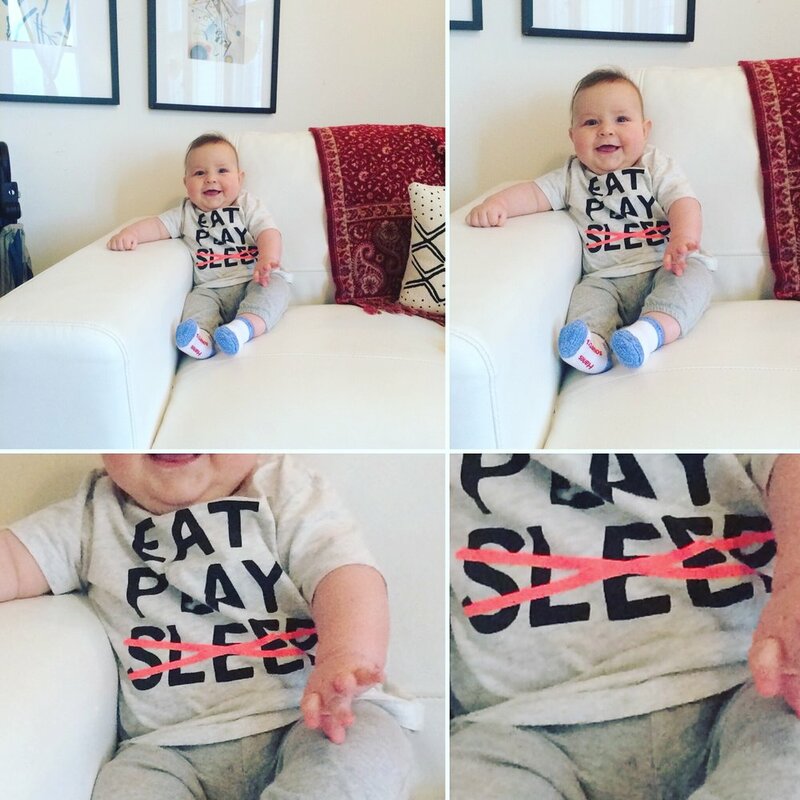 Even though we applied a sleep-training technique at around 2 months, the infamous 4-month sleep regression was a storm that came early and has lingered too long. He’d gotten so close to sleeping through the night - waking up only once! - and then all of the sudden it was back to square one, to before we’d even done the sleep training, waking up every 2 hours! Bad for parent sleep, bad for parent morale. And then nap-times are a whole different deal: sleeping well at night does not necessarily equal going down easily at nap-time (and staying down). One popular theory is that he is indeed hungry and perhaps ready for baby cereal - a common gateway to solids. So we decided to give it a shot, in the quest for the ever-elusive bliss of an uninterrupted night of sleep. We actually started with a more “ceremonial” tasting, of kale. I’d read that introducing more difficult flavors early on could help with his acceptance of them later - i.e., kale, spinach, broccoli, etc. - foods with which toddlers are famous for exercising veto power. So at the ripe-old age of 20 weeks, Benji had his first taste of “food”: organic kale grown in our very own community garden this summer! Ceremonial indeed. Pretty sure he swallowed none of it. Respecting the rule to wait a bit for potential allergies/reactions to manifest, a few days later we gave him his first tastes of baby cereal - oatmeal, really - a kind of powder that I mixed with breast milk. It was more of a hit, to say the least! As far as introducing more foods, I think we’ll wait until he’s closer to 6 months, for a couple of reasons. For one, adding the oatmeal has already prolonged the time spent in a day feeding him (a lot!). 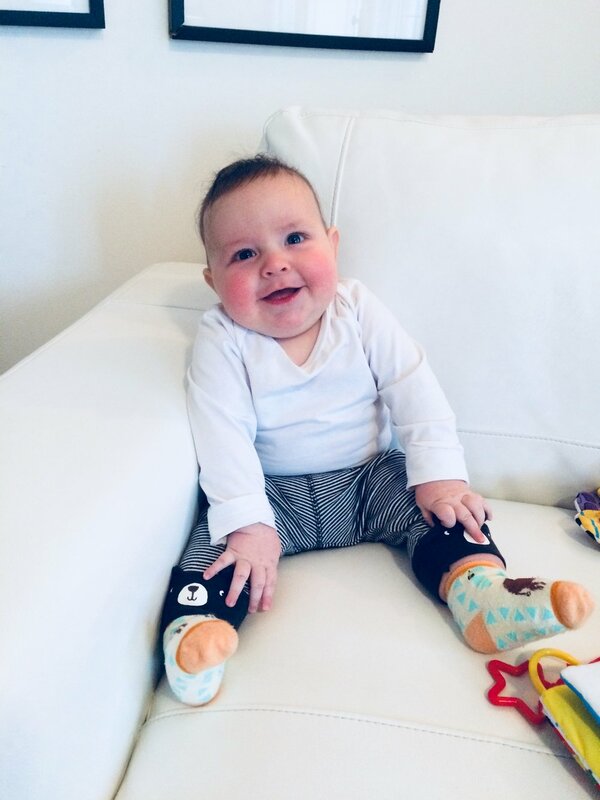 But also, we’re interested in letting him feed himself with bite-sizes of easily chewable foods (bananas, soft pears, steamed veggies, avocado, etc. ), and that takes more refined motor skills that start showing closer to 6 months. More to come on that! So far, the nights have improved since he started eating the oatmeal. But it’s hard to say if it’s just the added food that has helped, because we also got more strict again with the sleep training after a few weeks of regression on our part. (I was finding it really difficult to do it on my own, with Mat back in school). And the nap-times are still a challenge, so… who knows! a little walk by the river to explore the emerging fall colors! one of the best parts of living up here! The management of eating and naps takes up most of my day, but I try to steal a few moments to do other things. On a good day, he’ll nap for a solid two hours in the morning, during which I have time to myself to drink copious amounts of coffee and read the news, or write, or try to squeeze in an exercise video. But because there’s still a fair amount of variance to his schedule, I find it hard to really get into any projects. On less-good days, he doesn’t link his sleep cycles together, so he’ll wake up after 45 minutes/one hour. If I leave him to try to get himself back to sleep, he just screams (he’s proven he can do this for upwards of 90 minutes, impressive). Or if I go get him (I’ve lost some of my resolve with waiting-out the crying), he’ll be tired again after 30-45 minutes, do another nap of 45-60 minutes, then be up again for 45 minutes… and on and on until the day is done and I’ve had zero time to accomplish anything else. Despite this post sounding mostly like complaining, there really are plenty of good times! Watching a human grow from a sack of barely-animated bones into a lively baby discovering control of his motor functions is pretty amazing. And those smiles… yep, they melt your heart as advertised. I can’t stop taking photos of the most mundane things; I’m quickly running out of cloud storage! what is it about these darn footsy pyjamas that is just so freakin’ cute?! On a bright note: he does reliably go down for the night at 7 p.m., after which we get some time to recharge the batteries, and may I just say it is priceless! With Mat back in school, he spends most days from 8 a.m. - 3 p.m. (sometimes even later) in class, plus many more hours studying. So even when he’s home, he’s not really “home.” And during the big rush before an exam week… oh, boy. It’s rough. But it makes the evenings golden! My latest hobby is listening to podcasts or long-form articles read aloud (by a cool app, called Audm) while coloring in one those adult coloring books. While Mat is studying, I curl up on the couch, pull on the headphones and lose myself in tiny flower tapestries. I’ve recently discovered Slow Burn, a podcast exploring not-too-distant-past political scandals (Watergate, Clinton-Lewinsky). I find the Clinton one especially interesting, having “lived through it” but was too young to really follow or make any sense of it (something the podcast reveals was difficult for pretty much everyone at the time). Surely there will be many photos to share for the next post. Until then, a few selections from the latest of my favorite photo op spots: Benji’s corner of the couch.